Northern industrialization expanded rapidly following the War of 1812. Industrialized manufacturing began in New England, where wealthy merchants built water-powered textile mills (and mill towns to support them) along the rivers of the Northeast. These mills introduced new modes of production centralized within the confines of the mill itself. As never before, production relied on mechanized sources with water power, and later steam, to provide the force necessary to drive machines. In addition to the mechanization and centralization of work in the mills, specialized, repetitive tasks assigned to wage laborers replaced earlier modes of handicraft production done by artisans at home. The operations of these mills irrevocably changed the nature of work by deskilling tasks, breaking down the process of production to its most basic, elemental parts. In return for their labor, the workers, who at first were young women from rural New England farming families, received wages. From its origin in New England, manufacturing soon spread to other regions of the United States. During the seventeenth and eighteenth centuries, artisans—skilled, experienced craft workers—produced goods by hand. The production of shoes provides a good example. In colonial times, people bought their shoes from master shoemakers, who achieved their status by living and working as apprentices under the rule of an older master artisan. An apprenticeship would be followed by work as a journeyman (a skilled worker without his own shop). After sufficient time as a journeyman, a shoemaker could at last set up his own shop as a master artisan. People came to the shop, usually attached to the back of the master artisan’s house, and there the shoemaker measured their feet in order to cut and stitch together an individualized product for each customer. In the late eighteenth and early nineteenth century, merchants in the Northeast and elsewhere turned their attention as never before to the benefits of using unskilled wage labor to make a greater profit by reducing labor costs. They used the putting-out system, which the British had employed at the beginning of their own Industrial Revolution, whereby they hired farming families to perform specific tasks in the production process for a set wage. In the case of shoes, for instance, American merchants hired one group of workers to cut soles into standardized sizes. A different group of families cut pieces of leather for the uppers, while still another was employed to stitch the standardized parts together. This process proved attractive because it whittled production costs. The families who participated in the putting-out system were not skilled artisans. They had not spent years learning and perfecting their craft and did not have ambitious journeymen to pay. Therefore, they could not demand—and did not receive—high wages. Most of the year they tended fields and orchards, ate the food that they produced, and sold the surplus. Putting-out work proved a welcome source of extra income for New England farm families who saw their profits dwindle from new competition from midwestern farms with higher-yield lands. Much of this part-time production was done under contract to merchants. Some farming families engaged in shoemaking (or shoe assemblage), as noted above. Many made brooms, plaited hats from straw or palm leaves (which merchants imported from Cuba and the West Indies), crafted furniture, made pottery, or wove baskets. Some, especially those who lived in Connecticut, made parts for clocks. The most common part-time occupation, however, was the manufacture of textiles. Farm women spun woolen thread and wove fabric. They also wove blankets, made rugs, and knit stockings. All this manufacturing took place on the farm, giving farmers and their wives control over the timing and pace of their labor. Their domestic productivity increased the quantity of goods available for sale in country towns and nearby cities. In the late 1790s and early 1800s, Great Britain boasted the most advanced textile mills and machines in the world, and the United States continued to rely on Great Britain for finished goods. Great Britain hoped to maintain its economic advantage over its former colonies in North America. So, in an effort to prevent the knowledge of advanced manufacturing from leaving the Empire, the British banned the emigration of mechanics, skilled workers who knew how to build and repair the latest textile machines. Some skilled British mechanics, including Samuel Slater, managed to travel to the United States in the hopes of profiting from their knowledge and experience with advanced textile manufacturing. Slater ([link]) understood the workings of the latest water-powered textile mills, which British industrialist Richard Arkwright had pioneered. In the 1790s in Pawtucket, Rhode Island, Slater convinced several American merchants, including the wealthy Providence industrialist Moses Brown, to finance and build a water-powered cotton mill based on the British models. Slater’s knowledge of both technology and mill organization made him the founder of the first truly successful cotton mill in the United States. 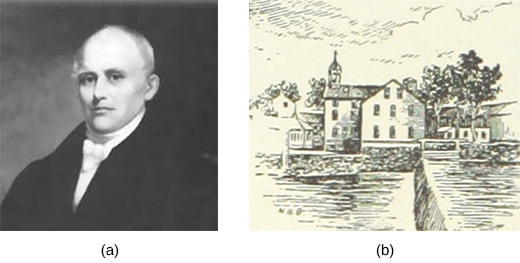 Samuel Slater (a) was a British migrant who brought plans for English textile mills to the United States and built the nation’s first successful water-powered mill in Pawtucket, Massachusetts (b). The success of Slater and his partners Smith Brown and William Almy, relatives of Moses Brown, inspired others to build additional mills in Rhode Island and Massachusetts. By 1807, thirteen more mills had been established. President Jefferson’s embargo on British manufactured goods from late 1807 to early 1809 (discussed in a previous chapter) spurred more New England merchants to invest in industrial enterprises. By 1812, seventy-eight new textile mills had been built in rural New England towns. More than half turned out woolen goods, while the rest produced cotton cloth. Slater’s mills and those built in imitation of his were fairly small, employing only seventy people on average. Workers were organized the way that they had been in English factories, in family units. Under the “Rhode Island system,” families were hired. The father was placed in charge of the family unit, and he directed the labor of his wife and children. Instead of being paid in cash, the father was given “credit” equal to the extent of his family’s labor that could be redeemed in the form of rent (of company-owned housing) or goods from the company-owned store. For measuring and folding, 300 a year; it cost approximately $600 a year to support a family of five. Many workers undoubtedly enjoyed some of the new wage opportunities factory work presented. For many of the young New England women who ran the machines in Waltham, Lowell, and elsewhere, the experience of being away from the family was exhilarating and provided a sense of solidarity among them. Though most sent a large portion of their wages home, having even a small amount of money of their own was a liberating experience, and many used their earnings to purchase clothes, ribbons, and other consumer goods for themselves. The long hours, strict discipline, and low wages, however, soon led workers to organize to protest their working conditions and pay. In 1821, the young women employed by the Boston Manufacturing Company in Waltham went on strike for two days when their wages were cut. In 1824, workers in Pawtucket struck to protest reduced pay rates and longer hours, the latter of which had been achieved by cutting back the amount of time allowed for meals. Similar strikes occurred at Lowell and in other mill towns like Dover, New Hampshire, where the women employed by the Cocheco Manufacturing Company ceased working in December 1828 after their wages were reduced. In the 1830s, female mill operatives in Lowell formed the Lowell Factory Girls Association to organize strike activities in the face of wage cuts ([link]) and, later, established the Lowell Female Labor Reform Association to protest the twelve-hour workday. Even though strikes were rarely successful and workers usually were forced to accept reduced wages and increased hours, work stoppages as a form of labor protest represented the beginnings of the labor movement in the United States. New England mill workers were often young women, as seen in this early tintype made ca. 1870 (a). 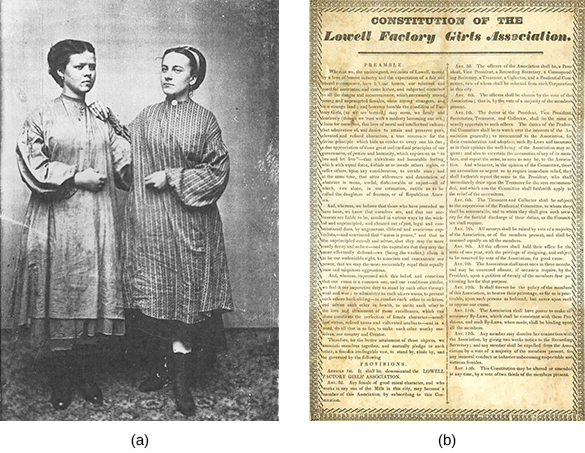 When management proposed rent increases for those living in company boarding houses, female textile workers in Lowell responded by forming the Lowell Factory Girls Association—its constitution is shown in image (b)—in 1836 and organizing a “turn-out” or strike. Critics of industrialization blamed it for the increased concentration of wealth in the hands of the few: the factory owners made vast profits while the workers received only a small fraction of the revenue from what they produced. Under the labor theory of value, said critics, the value of a product should accurately reflect the labor needed to produce it. Profits from the sale of goods produced by workers should be distributed so laborers recovered in the form of wages the value their effort had added to the finished product. While factory owners, who contributed the workspace, the machinery, and the raw materials needed to create a product, should receive a share of the profits, their share should not be greater than the value of their contribution. Workers should thus receive a much larger portion of the profits than they currently did, and factory owners should receive less. In Philadelphia, New York, and Boston—all cities that experienced dizzying industrial growth during the nineteenth century—workers united to form political parties. Thomas Skidmore, from Connecticut, was the outspoken organizer of the Working Men’s Party, which lodged a radical protest against the exploitation of workers that accompanied industrialization. Skidmore took his cue from Thomas Paine and the American Revolution to challenge the growing inequity in the United States. He argued that inequality originated in the unequal distribution of property through inheritance laws. In his 1829 treatise, The Rights of Man to Property, Skidmore called for the abolition of inheritance and the redistribution of property. The Working Men’s Party also advocated the end of imprisonment for debt, a common practice whereby the debtor who could not pay was put in jail and his tools and property, if any, were confiscated. Skidmore’s vision of radical equality extended to all; women and men, no matter their race, should be allowed to vote and receive property, he believed. Skidmore died in 1832 when a cholera epidemic swept New York City, but the state of New York did away with imprisonment for debt in the same year. Worker activism became less common in the late 1840s and 1850s. As German and Irish immigrants poured into the United States in the decades preceding the Civil War, native-born laborers found themselves competing for jobs with new arrivals who were willing to work longer hours for less pay. In Lowell, Massachusetts, for example, the daughters of New England farmers encountered competition from the daughters of Irish farmers suffering the effects of the potato famine; these immigrant women were willing to work for far less and endure worse conditions than native-born women. Many of these native-born “daughters of freemen,” as they referred to themselves, left the factories and returned to their families. Not all wage workers had this luxury, however. Widows with children to support and girls from destitute families had no choice but to stay and accept the faster pace and lower pay. Male German and Irish immigrants competed with native-born men. Germans, many of whom were skilled workers, took jobs in furniture making. The Irish provided a ready source of unskilled labor needed to lay railroad track and dig canals. American men with families to support grudgingly accepted low wages in order to keep their jobs. As work became increasingly deskilled, no worker was irreplaceable, and no one’s job was safe. Industrialization led to radical changes in American life. New industrial towns, like Waltham, Lowell, and countless others, dotted the landscape of the Northeast. The mills provided many young women an opportunity to experience a new and liberating life, and these workers relished their new freedom. Workers also gained a greater appreciation of the value of their work and, in some instances, began to question the basic fairness of the new industrial order. The world of work had been fundamentally reorganized. How were the New England textile mills planned and built? Experienced British builders traveled to the United States to advise American merchants. New England merchants paid French and German mechanics to design factories for them. New England merchants and British migrants memorized plans from British mills. Textile mills were a purely American creation, invented by Francis Cabot Lowell in 1813. Which is the best characterization of textile mill workers in the early nineteenth century? What effect did industrialization have on consumers? Industrialization made manufactured goods more abundant and more widely available. All but the poorest Americans were able to equip their homes with cookstoves, parlor stoves, upholstered furniture, and decorations such as wallpaper and window curtains. Even such formerly expensive goods as clocks were now affordable for most. Early Industrialization in the Northeast by OpenStaxCollege is licensed under a Creative Commons Attribution 4.0 International License, except where otherwise noted.